CycaLogical: Who Killed the High Street ? I love shopping. Doesn't everybody? I love expressing my individuality by buying goods mass-produced in Chinese sweatshops in characterless, mass-market outlets. Whenever shops and roads are in the news, the subject being reported is usually car parking. Not enough of it, or too expensive. But the reality is that shopping and cars do not mix. The New West End Company, who represent 600-odd central London retailers, know this, which is why they're campaigning for car-free days and pedestrianised streets. Shopping areas need to be places where you can linger, move around freely, maybe stop and relax with a coffee at a pavement cafe. And look - there's a friend or neighbour! Stop and have a chat? Why not! "Out-of-town centres create an environment where the shopper comes first, with wide footways and pedestrianised streets, and good public transport links such as free buses. This has taken business away from our high streets. In order to be places that people want to visit, high streets need to be accessible, attractive and safe...badly planned transport infrastructure can make high street shopping an inaccessible and unpleasant experience for pedestrians. And small and cluttered pavements, as well as busy roads, can make high streets unsafe for family shopping." Yet councils don't seem to understand this. Their idea of a high-street makeover is to do anything rather than address the fundamental problem. I've posted before about the 'new' Wimbledon Broadway, in which the pavements are slightly wider, the station concourse is now car-free, but other than that the experience is unchanged in all major respects. In fact, the only compelling evidence of change is the sizeable bill for digging up the roads. Is Richmond council any more enlightened? They have a proposal to "improve Twickenham Town Centre and reduce the impact of traffic". How are they going to do that? Clearly, people have to get to the town centre. According to the oxymoronically-titled Action Plan, "all new developments, environmental and transport improvements are designed to be sustainable" and "transport proposals positively enhance the street scene". Which can only mean better cycle facilities, right? Wrong. According to the Action Plan leaflet, there will be "limited widening of eastern footway in London Road through removal of cycle lane". You read that right - they were intending to remove cycle facilities, not make them better. 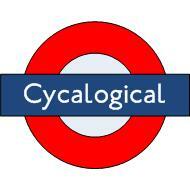 That is the only occurrence of the word 'cycle' or 'cycling' in the whole document. Unsurprisingly, the people who cycle around Twickers weren't too happy about the removal of their cycle lane, crap though it is, and objected. This prompted the Council to put out a statement saying they were "considering installing advisory cycle lanes", but then decided that they wouldn't bother. You're not going to reduce traffic levels if you treat cycling as an afterthought, or if under all the greenwash is the telling statement "Transport proposals will be subject to further detailed testing to ensure that they do not have an unacceptable impact on the highway network." It is quite clear that Richmond Council are quite happy for Twickenham to be somewhere to drive through on the way to somewhere else. Yet, if you look at the 'artists impression' on Page 6 of the Action Plan leaflet, it looks like they've reduced 4 lanes of traffic down to 2 on King Street. Separating the two lanes, there is a wide central area with cycle stands. This width could be used to provide a separate cycle track, but that idea obviously didn't occur to the Council. They're evidently happy for people to park their bike here, as long as they don't want to take the piss by, say, riding it there in the first place. "Sometimes campaigning to improve safety is counter productive. It puts potential new cyclist off. Is that what you want to do...Can we please have RCC [Richmond Cycling Campaign] encouraging people to cycle not putting them off." Put people off cycling? Richmond Council are clearly doing a much better job of that than Richmond Cycling Campaign ever will. Encouraging people to cycle while removing perhaps the only infrastructure that existed seems like a mixed message to me. And one that's potentially asking for trouble. The attractiveness of cycling is directly related to how safe people feel when they undertake it. Selling cycling as 'safe' while doing the utmost to undermine it as an option is frankly irresponsible to me. What killed the High street? Everyone who drives to out of town supermarkets and shopping centres / malls because they've got 'free' parking. So, in effect most of us have played a small but significant part, aided and abetted by the town and traffic planners and let's not forget the road lobby and the 'pile it high and sell it cheap' merchants'= - Tescos et al., together their lackeys the politicians (well most of them).